*Originally posted several years back…Please do not sleep. Today, we pay homage to maybe one of our favorite group EVER. and a legendary DJ that used to be down with “Afrika Bambataa” named ‘Foxx. They dropped their first EP in 1994 which became in 10 years one of the most revered underground records of ALL TIME. Thirteen years later,they’re about to drop the highly anticipated lp “GRYME TYME”. As an appetizer,Trinidad & Freddie Massif give you a taste of the work (past and present) of some of their heroes. It includes classic,unreleased and exclusive material hosted by the original members : BRANESPARKER & GW. FOXXX. 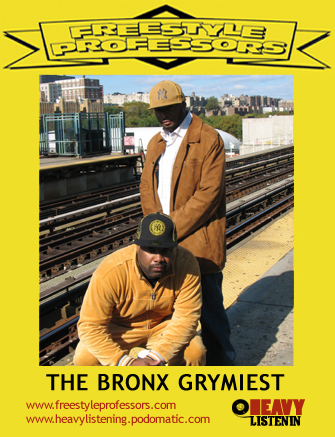 Over 1 hour of REAL RAP by the BRONX GRYMIEST…Branesparker, Giff (formerly known as Geo), G.W. Foxx and J-Superia. This entry was posted on October 28, 2014 by hiphopbattlefield. It was filed under Uncategorized .